Animal Shelter Workers Do Excruciating Work. Treat Us Better. This morning I received a soul-stunting letter that sliced into my Sunday daybreak coffee and took me back to a world decades ago where I grew up watching my mother express frequent concern for her very close animal control officer friend. Today's message, written by a shelter director, reminded me that although many wonderful advancements have occurred throughout a great number of years within the realm of animal welfare, the plight of those who care directly for those affected creatures remains the same. They're often hastily labeled murderers by those with no understanding of the ramifications therein. They're: "lazy," "not doing enough," "not listening," "not compassionate." Even though there are instances where that may be true - where those with the sharpest finger-pointing and loudest bullhorns believe they're casting an immediate light of change through their perceived whistleblowing atop hollow stilts, there is never an instance where that sort of hate-parade reflects advancement. Positive change happens through sincerity and commitment, thick skin, lack of self, and the willingness to first become a student before one can be considered the professor. Certainly, we're all humanly capable and prone to err. However, when we begin to neglect the human element, the price we charge others for our mistakes is grievous beyond repair. As one who has witnessed the results of my own cutthroat follies, I know this all too well. And maybe that is why this letter stabs me in the heart the most. Life gives us all opportunities to learn, and if we're lucky, the lessons we gather along the way will help each of us leave this world far greater. Together. 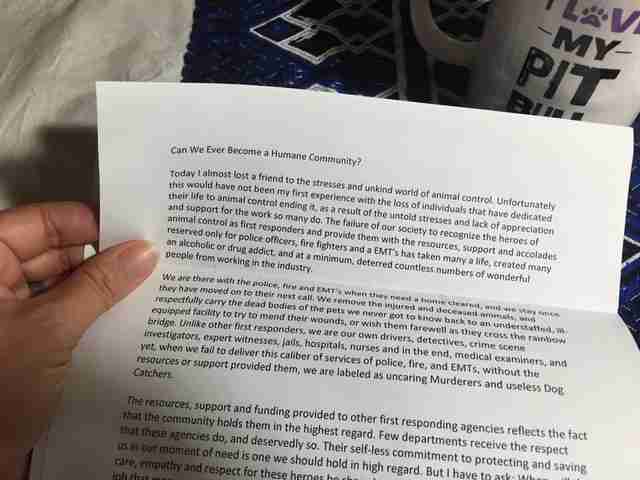 Thank you to the shelter director who wrote the following words. I hope, in publishing this letter, your employee will read it and know s/he is respected and revered for providing a difficult public service, even when the thanks are often overshadowed by the pain. Can We Ever Become a Humane Community? Today I almost lost a friend to the stresses and unkind world of animal control. Unfortunately, this would have not been my first experience with the loss of individuals who have dedicated their lives to the work of animal control ending it, as a result of the untold stresses and lack of appreciation and support for the work so many do. The failure of our society to recognize the heroes of animal control as first responders and to provide them with the resources, support and accolades reserved only for police officers, fire fighters and EMTs has taken many a life, created many an alcoholic or drug addict, and at a minimum, deterred countless numbers of wonderful people from working in the industry. We are there with the police, fire and EMTs when they need a home cleared, and we stay once they have moved on to their next call. We remove the injured and deceased animals, and respectfully carry the dead bodies of the pets we never got to know back to an understaffed, ill-equipped facility to try to mend their wounds, or wish them farewell as they cross the rainbow bridge. Unlike other first responders, we are our own drivers, detectives, crime scene investigators, expert witnesses, jails, hospitals, nurses and in the end, medical examiners, and yet, when we fail to deliver the caliber of services of police, fire, and EMTs, without the resources or support provided them, we are labeled as uncaring murderers and useless dog catchers. The resources, support and funding provided to other first responding agencies reflects the fact that the community holds them in the highest regard. Few departments receive the respect that these agencies do, and deservedly so. Their selfless commitment to protecting and saving us in our moment of need is one we should hold in high regard. But I have to ask: When will the care, empathy and respect for these heroes be shared with the selfless individuals that do the job that many say they could never do "because they care about animals too much?" Animal control workers make the daily sacrifice of putting our desire to make a difference and to ensure those precious souls have someone that cares about them before our own emotions. We cry ourselves to sleep, when we can sleep, and if the never ending stream of cruelty and unkind gestures of people towards the animals we care so deeply about doesn't kill us, or force us to move on to a healthier career choice, we get to suffer the injustice of just how truly cruel people can be, not only to animals, but to those that devote their lives to them. There is a lack of human in being humane when it comes to how we care for our animal care workers. The respect for the sacrifices, and the lack of resources, never deliver the final blow to an animal control worker's life or career. It is the blows delivered by the very same people that speak about being kind to animals and use words like "care" and "compassion" in their posts for the animals that touch all of our lives so deeply and cause so much pain. It isn't easy facing the never ending stream of animals each day. It's challenging facing the anger and frustration of people not wanting to be told how to care for their pets. It's devastating when you have to make the "call" because there is no more room in the shelter, and the stream of animals entering the shelter just won't stop. But this selfless commitment goes unrewarded, unrecognized and constantly criticized until the lack of resources, constant stream of homeless and abused pets, and lack of support from the community becomes enough to make it all not worth it. The long hours, the challenging statistics, the shortage of resources, but most painful of all is the cruelty toward animal care workers from those claiming to love animals on their blogs and websites. We're working in the trenches day in and we're making a lasting change. Why? Because the animals count on us. Texas, more than any other state across the nation, is exceptionally hard on its animal control staff, as the larger agencies are typically buried underneath large, under-resourced, code departments, or are nothing more than a staff of one or two fighting alone to be effective and compassionate at the same time, with little to no support. 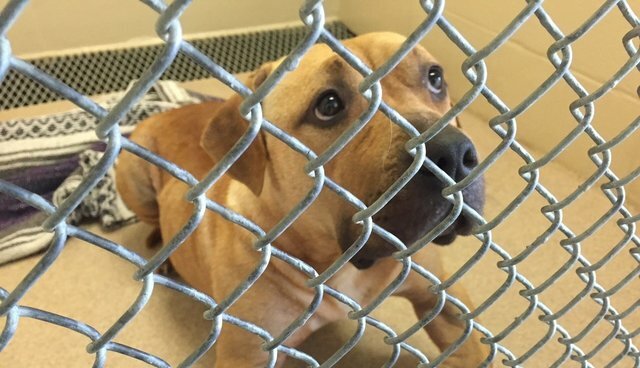 Texas shelters have some of the highest euthanasia rates in the country, and the lowest funded animal control agencies. One has to wonder, will we ever get there as a community divided, or have we been fighting the battle for so long we no longer see that we should all be on the same side? Read the original post at Sweetie the Incredible. Wave "hi" to Sweetie the Incredible at Six Days at the Fair and on her FB page.